Can you believe fall is here already! I wish it could be fall year-round! I love everything that is fall: crisp, cool air, colored leaves, sweaters, blankets, the smell of smoke, and cinnamon in my coffee. Fall is my happy. I like to take inspiration from nature and my favorite fall outfit for fall decorating. Chunky sweaters, leather bags, moccasins, a scarf...think of taking a walk through the cool woods in the perfect fall outfit while sipping on a hot pumpkin spice latte. Autumn perfection right there. That's the feeling I want to evoke with my fall decor. I dislike a lot of the premade, cartoon-y decor that you can find in the stores. It's not exactly the Audrey Hepburn version of home decor, if you know what I mean. I want classy, natural, touches of fall and I want to use a lot of things I already have to create that warm, cozy look. Things that I can use year-round if I want. 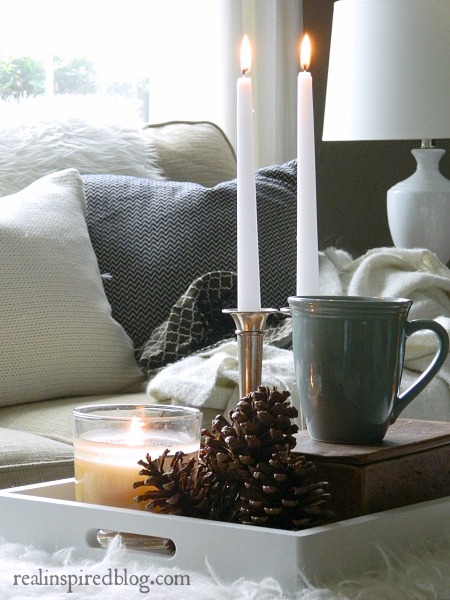 It's really simple to create that cozy fall look with just a few elements that you probably have around you already! Ok, this is the one thing on the list that is unique to fall and that you might not have on hand. These babies make any room feel like fall just by being in it! Be they fake or real, orange or white. Did you know that you can paint pumpkins? 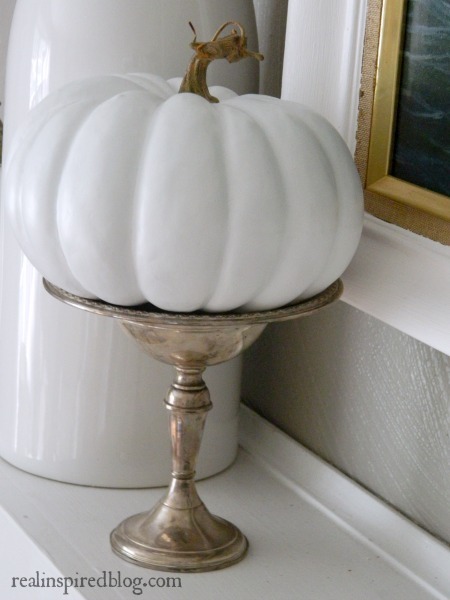 Last year I spray-painted fake pumpkins for my fall decorating. You can also just pick up a brush and paint them. 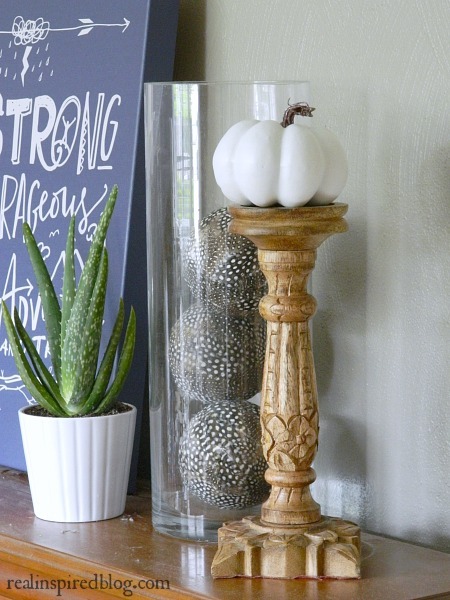 Fake pumpkins are great because you can use them year after year! Use fabrics that evoke warmth. And lots of them. 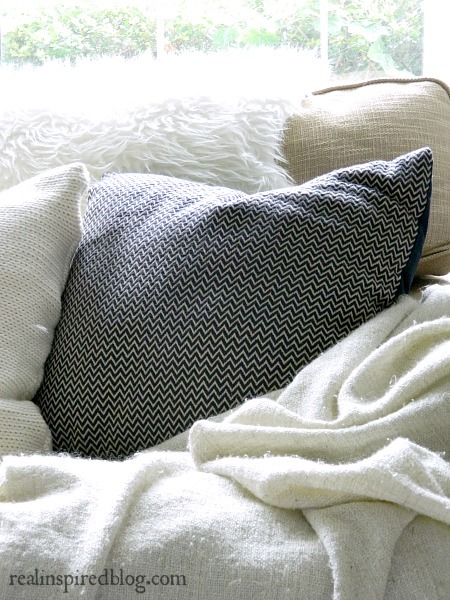 Layer knit blankets and pillow covers, fur pillows, leather, and sheepskin. Adding lots of blankets to a room makes a room seem cozier. Drape blankets over furniture, stack them to the side, or roll and put in a basket. I'm a firm believer in many blankets and an abundance of pillows. The cooler months give me the perfect excuse to pull them out! Candles! Candles everywhere. And light them! Too many people just sit their candles out and then never light them. I tend to forget mine because when I do light them, I have to keep them out of reach of little hands. If it was just me here at home by myself all day, I'd burn through candles(I just couldn't resist that one) like it was my job. Candles just make everything seem homey and warm. My favorite ones for fall are spice scented. I love candles that make it smell like I've been cooking cinnamon apples all day! Bring the outside in! Feathers, sticks, leaves, and pinecones always make it feel more like fall. Go out and gather a bundle from your backyard. Stick a branch of colorful leaves in a vase or stack a bundle of branches by the fireplace. 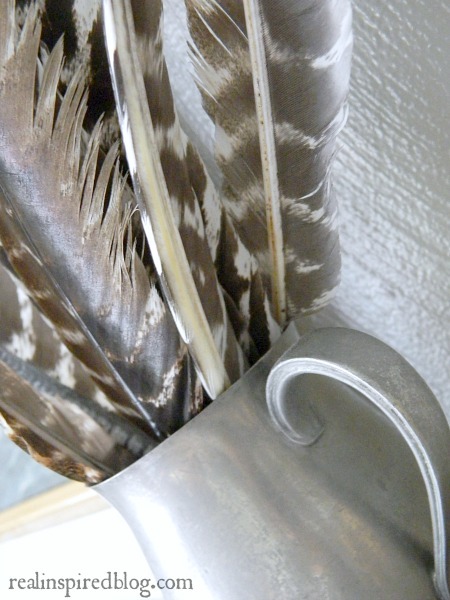 I picked up a bunch of large wild turkey feathers on our trip to Michigan earlier this year and I love them bunched in this antique pewter pitcher! I also like to use the same method with sticks from our yard. Pinecones in a bowl is great too! Wooden candlesticks, bowls, trays, and boxes are an easy way to make things look a little more like fall. Wood lends that rustic, warm feel. I have a ton of these things around. You can see one of my many wooden boxes above under #3. They are super great for holding remotes, envelopes, keys, etc. And nope, I didn't dust. Oops. I have a thing for baskets. They have got to be the best decorative storage out there! Tons of warmth and texture are added to a room when there are baskets. Use them to hold magazines or books, blankets or pillows. Or gourds! I'm pretty sure that everything looks better in a basket. I put this one last because you don't really have to use the typical fall colors to decorate for fall. You can have an all white palette and still have a cozy fall room by following the other 6 pointers. But you can use them if you want. It can be as simple as using orange pumpkins, moving around a few brown pillows from a different room, or placing a branch of red maple leaves into a vase. What are some of your absolute favorite things about fall? Do you even decorate for fall? 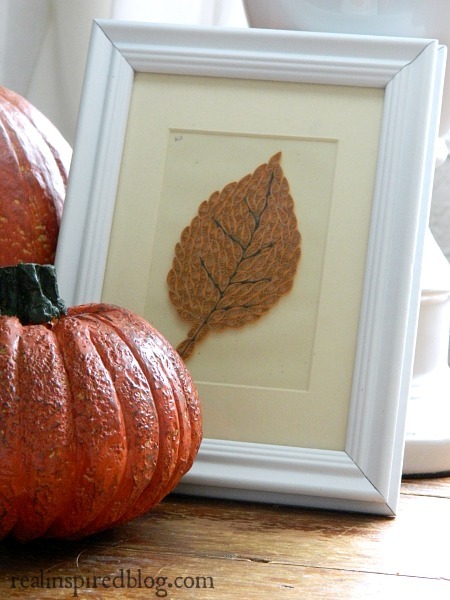 If so, how do you bring some fall into your home? And guess what? 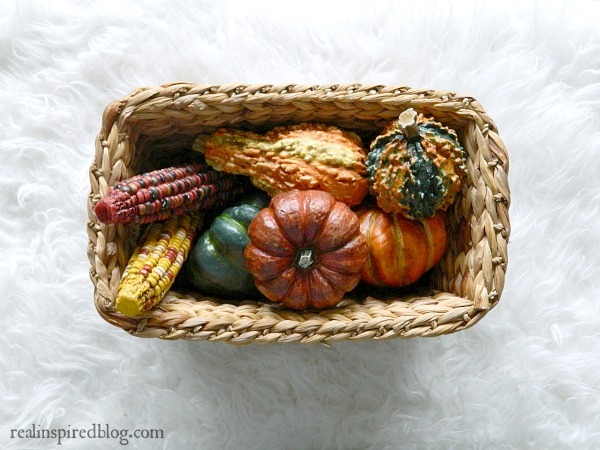 You just got a glimpse of some of my fall decor! I'll be sharing my fall mantel on Friday. You'll have to drop by and see it!